My fiancé is a serious movie theater popcorn snob. I’m no longer allowed to be in charge of the popcorn when we go see a movie. Apparently there is a right and a wrong way to add extra butter or salt to it and I do it the “wrong” way! I, on the other hand, am a caramel popcorn snob. My family used to get the instant caramel popcorn made by Orville Redenbacher when I was a kid, but I can never find it in stores anymore! It’s really a bummer because that stuff was so good. I would usually start eating it while the caramel was still way too hot, burning my fingers and mouth in the process, because I just couldn’t wait any longer to devour it. Luckily, I’ve found a recipe for homemade caramel popcorn that can be made with just a few simple ingredients, and in less than 30 minutes. Well, I guess that depends on how patient you are, because if you are like me, you may not be able to wait for it to cool down before you start devouring it. 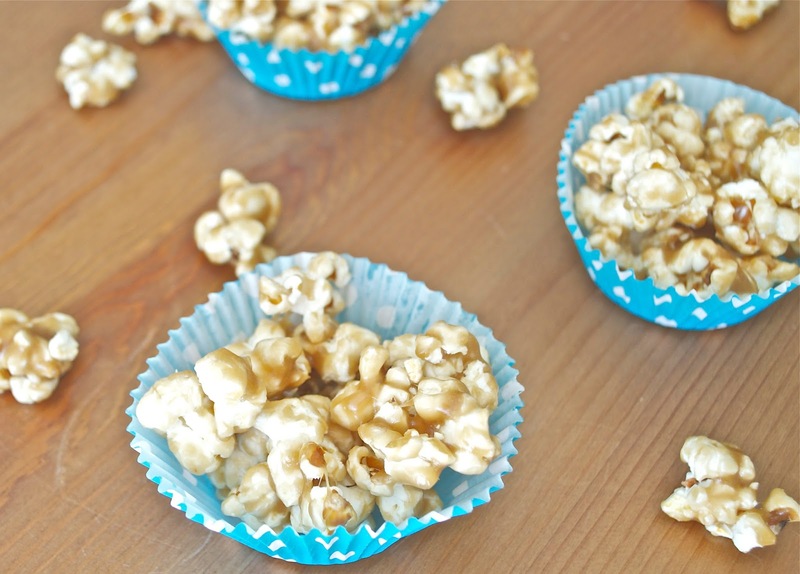 Even as a caramel popcorn snob, I think this homemade version is pretty darn good! 1. Microwave your popcorn as directed on box, and place in a large bowl, picking out all kernels. 2. In a medium saucepan, heat brown sugar, butter, corn syrup, and salt over medium heat. Stir occasionally with a wooden spoon or heat resistant spatula in order to incorporate the butter. 3. Once the mixture begins to form large bubbles, turn on a timer for 5 minutes, and leave the mixture alone. Do NOT touch or stir it for the next five minutes. Leave it alone! 4. While the mixture is heating, line a large cookie pan with wax paper. 5. At the end of 5 minutes, remove the caramel mixture from heat, add in baking soda and vanilla and stir. 6. Carefully pour in about half of the caramel mixture into your bowl with the popcorn, and use your spatula or wooden spoon to toss and coat the popcorn. Then, add in the second half of the caramel and continue to toss until all of the popcorn is well coated. 7. Dump out the popcorn onto the lined cookie sheet and spread out evenly. Allow to cool completely, then break large clumps apart into small clusters. Store in an airtight container.